My short story “The New Gods of the Lost Children” has been reprinted in the new anthology Suffer the Little Children from Cruentus Libri Press. Girls and boys, have come out to play, The moon doth shine as bright as day; Leave your supper, and leave your sleep, And face the demons from the deep… Cruentus Libri Press brings you sixteen tales of horror and the macabre featuring children facing their fears face on. From old myths to new gods; from bloodthirsty trolls beneath the bridge to the untold horrors of the ball pond, these are stories to inspire any parent to pull their children close and hold them tight. 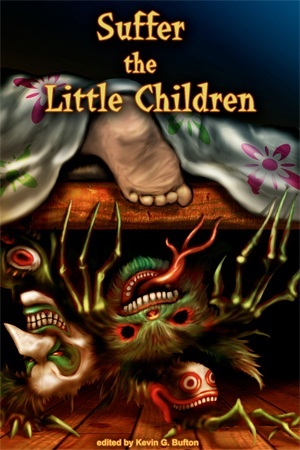 Suffer the Little Children contains stories from the world’s finest horror authors, including DJ Cockburn, Jonathan Ward, Deb Eskie, J.A. Grier, Paul Edmonds, Joanna Parypinski, Bryan Best, Randy D. Rubin, Kevin G. Bufton, Gregory J. Wolos, Die Booth, Derek Muk, Paco, Jay Wilburn, John M. McIlveen and Jason Andrew.